ONE OWNER – FULL HISTORY! A well-kept new shape Ford Fiesta Zetec in Vision Blue metallic. This car has a full service history, including a recent cambelt and water pump change with just 1 private female owner since new. Sold with both keys, all books/manuals, a brand new MOT and our nationwide parts and labour warranty. Features include Bluetooth telephone, alloy wheels, remote central locking, MP3 CD player with aux. 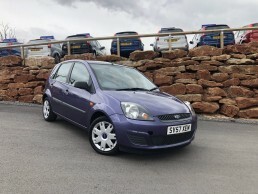 Input, multiple airbags, leather multifunction steering wheel, ISOFIX child seat fixings, electric windows/mirrors, QuickClear heated front screen, air conditioning plus all usual Fiesta refinements. Drives brilliantly and is HPI checked and clear. Part-exchange and finance options available, subject to approval. Call 0117 290 1234 or book your test drive using our online booking form. A new-shape 2009 Ford Fiesta Zetec in blue, with a range of features to enhance your driving experience. Please call us 0117 290 1234 or use our online test drive booking system with your questions or to pre-book your test drive at our forecourt in Winford, Bristol.